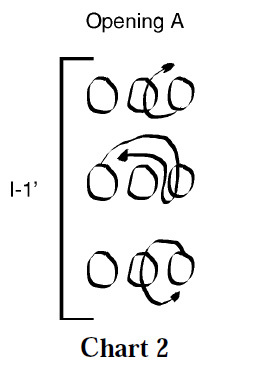 Despite their apparent complexity the procedures for making most string figures are essentially the same: loops derived from an initial loom are drawn through each other until a pleasing design results. During this procedure loops are often twisted, exchanged, dropped, or created anew from portions of existing loops. Understanding the consequences of each manipulation allows one to skillfully alter the weaving sequence. The entire Vertical Net family of figures arose from a careful analysis of the positions of the two transverse strings in the final weaving stages of the Inuit Net. In theory it should be possible to mimic many simple weaving sequences artificially using a series of loop passage or braiding maneuvers. During a loop passage maneuver a loop is temporarily removed from a finger (often by the opposite hand), passed up (or down) through another loop, then reset on its original finger. •	Pass your right thumb and index finger down through the left index loop; grasp the segment of string that crosses the back of the left little finger); lift the left little finger loop off the left little finger, draw it up through the left index loop, then return the loop, without twisting it, to the left little finger. Repeat on the opposite hand. •	Pass your right thumb and index finger down through the left little finger loop, then toward you over the left index loop; grasp the segment of string that crosses the back of the left thumb; lift the left thumb loop off the left thumb, draw it up through the left little finger loop, then pass it toward you over the left index loop and return the loop, without twisting it, to the left thumb. Repeat on the opposite hand. •	With your right thumb and index grasp the segment of string that crosses the back of the left little finger, lift the left little finger loop off the left little finger, pass the loop down through the left index loop, then return the loop, without twisting it, to the left little finger. Repeat on the opposite hand. The inverse of the first Inuit weave can be accomplished in a similar fashion. •	Pass your right thumb and index finger down through the left index loop; grasp the segment of string that crosses the back of the left little finger; lift the left little finger loop off the left little finger, draw it up through the left index loop, then return the loop, without twisting it, to the left little finger. Repeat on the opposite hand. 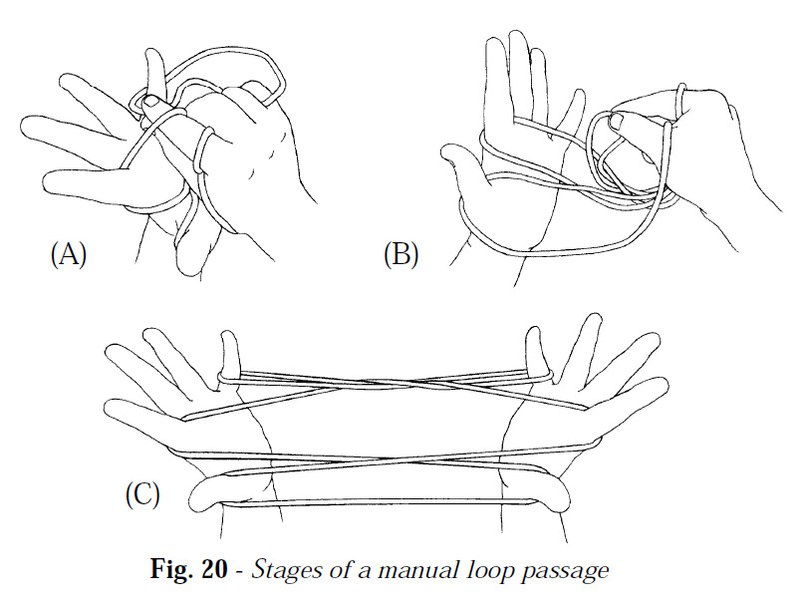 •	With your right thumb and index finger grasp the segment of string that crosses the back of the left thumb and lift the left thumb loop off the left thumb; pass the loop you are holding over the left index loop, down through the left little finger loop, then toward you over the left index loop; return the loop, without twisting it, to the left thumb. Repeat on the opposite hand. •	With your right thumb and index grasp the segment of string that crosses the back of the left little finger, lift the left little finger loop off the left. *It’s important to note that simple loop transfers do not change the core or “heart” of a partially completed string figure: the internal relationships of the various loops remains the same, (loop x passes through loop y, which passes through loop z, etc.) regardless of which fingers support the loops. It therefore seems appropriate to retain the names “First Inuit Weave” and “First Inuit Weave Inverse” for the string arrangements shown in the two previous figures, even though the middle finger loop has been transferred to the thumb in each case. This convention will be applied throughout the remainder of this book. little finger, pass the loop down through the left index loop, then return the loop, without twisting it, to the left little finger. Repeat on the opposite hand. 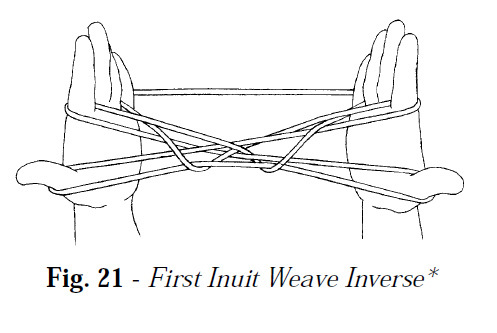 This analysis suggests that the only difference between the first Inuit weave and its inverse is the direction in which the thumb loop passes through the little finger loop. •	Pass the thumb, carrying its loop near the top of the thumb, over the index loop, then up through the little finger loop; transfer the thumb loop to the top of the little finger and return the thumb to its original position; pass the thumb over the index loop, transfer the upper little finger loop to the thumb, and return the thumb to its original position. •	Pass the thumb over the index loop, transfer the little finger loop to the thumb, then re-transfer this loop to the top of the index finger and return the thumb to its original position; now pass the thumb up through both index loops, transfer the upper index loop to the top of the thumb, carry this loop down through the lower index loop, and transfer it to the little finger; return thumb to its original position. 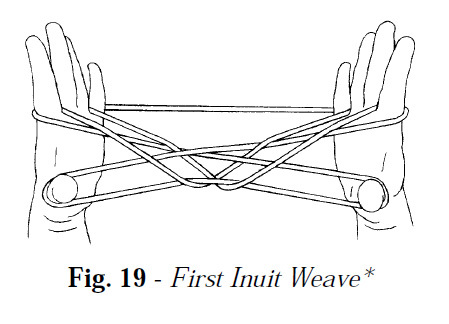 The result is the first Inuit weave (see chart 1). •	Pass each thumb under the index loop; transfer the little finger loop tothe top of the thumb, then pass the thumb, with its loops, up through the index loop; transfer the upper thumb loop to the little finger and return the thumb to its original position. •	Pass the little finger over the index loop, then transfer the thumb loop to the top of the little finger and return; pass the thumb over the index loop, then up through the little finger loops; transfer the upper little finger loop to the thumb, carry this loop down through the lower little finger loop, and return the thumb to its original position. 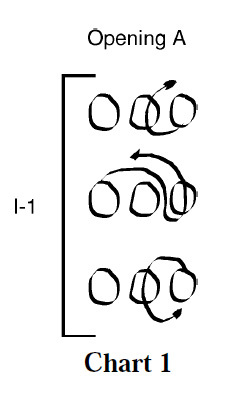 With practice, one can learn to do almost any loop passage sequence using transfers. When a long series of transfers is done rapidly and smoothly, the motions are mesmerizing to watch (the hands will appear to “dance”).